Small 4 Style: KISS InstaWave Rotating Curling Iron = Pretty Curls! KISS InstaWave Rotating Curling Iron = Pretty Curls! Ready to get curls that "boing?" I recently got a new beauty tool that gives you perfect curls with the touch of a button. 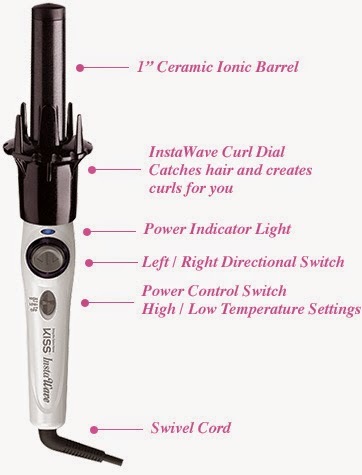 The KISS InstaWave is an automatic, rotating curling iron that makes the best ringlets I've been able to do on my own. I love curly hair but I rarely do it because I get frustrated. I've never mastered the art of wrapping my strands around the barrel effectively. The InstaWave does that for me! Just place a strand of hair in the rod, click the dial to the left or right, and the InstaWave will spin your hair into a curl without tangling it. I thought it was a little hard to use at first, but with a few minutes of practice it was so easy to get bouncy curls. So if you're having trouble with it at first, don't give up on it. The trick is to hold it upright and release the curl gently. My hair has never really curled well because they usually fall a few hours later. My KISS InstaWave curls lasted overnight with little uncoiling. You can set the heat setting high or low for tight or loose curls. Looks likes I'll be sporting bouncy curls a lot more in the future! Remember, Christmas is right around the corner and the InstaWave makes a great gift for you and your beauty-addicted loved ones. The KISS InstaWave is available at Ulta and Target.